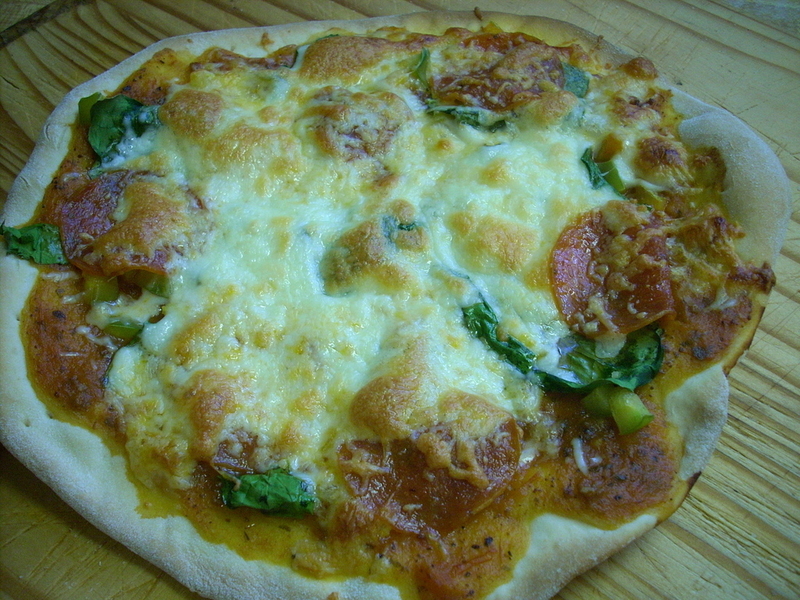 Hannah and I went out and about so ended up having a late lunch – more homemade pizza! See I told you I like eating the same things over and over! Of course, I made some modifications, i.e. NO ONIONS! “:evil:” And I reduced the amount of butter from 5 tablespoons to 1, reduced the potatoes from 2 pounds to 1.5 pounds, and then reduced the amount of cheese from 10 ounces to 8. It calls for all blue cheese, and while I am a fan, I didn’t want to have it overshadow the whole soup, so I did 4 ounces of blue cheese and 2 ounces of the last of my gouda mustard seed cheese. 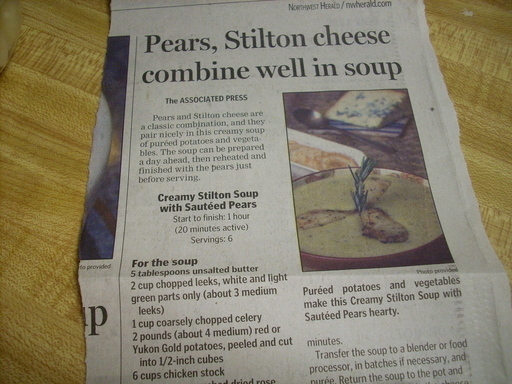 And while I think the sauteed pears are a nice touch, for soup for lunches, it didn’t make sense. In a large, heavy pot over medium heat, melt the butter. Add the celery and saute until softened, about 5 minutes. Add the potatoes, stock and thyme. Bring to a simmer and reduce heat and cook, uncovered, until the vegetables are very tender, about 20 to 25 minutes. Transfer soup to blender (unless you have a stick blender like me) and puree. 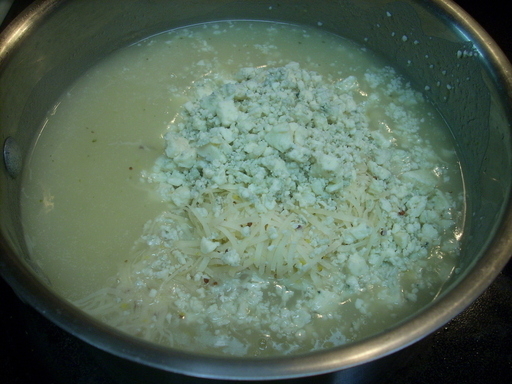 Over low heat, whisk in the cheese until it melts, then whisk in the milk. heat for another minute and salt and pepper totaste. My version: Makes 8 cups: 182 calories, 8 fat, 17 carbs, 1.75 fiber, 8 protein. The result? So good! Look at all that goey cheese before it melted! 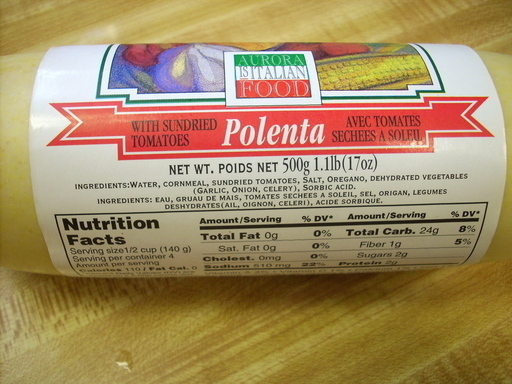 I decided to try the Blogger Secret Ingredient challenge from this weeks ingredient: POLENTA! Check it out at www.rhodeygirltests.com. Dice up 2 ounces of pancetta and pan fry to render out some of the fat. Remove to separate plate after its browned. Rinse out pan and pan fry slices of polenta in splash of olive oil mixed with butter flavored Pam. When browned on both sides, remove to plate. Heat pan to high and stir fry 3 ounces raw shrimp in 1/2 teaspoon olive oil, Italian seasoning and minced garlic (and lots of cracked pepper!). 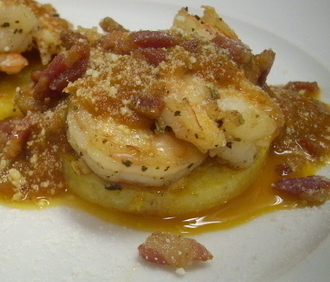 The only thing I would do differently was to pan fry the polenta a bit more for a crispier crust, but this was SO GOOD! 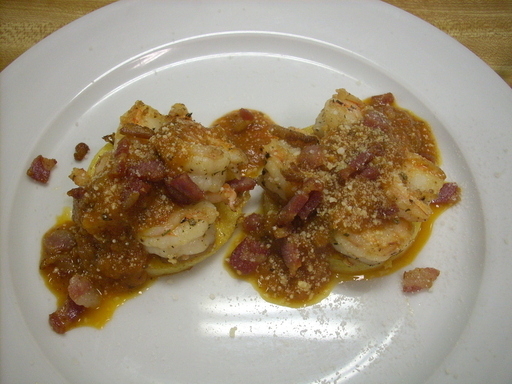 Thanks to the hubby for suggesting the pancetta – it made the recipe!